When we create anything for the home, whether it’s a furniture upcycle or a decor accessory, we want that piece to last for many years. With a child’s room and especially with a nursery, the child usually outgrows the space within just a few years. For that reason, we wanted to create something that would not only look great in a nursery but also any room in the house. 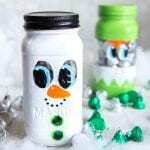 Fusion Mineral Paint has a beautiful new line of paints called Tones for Tots designed and developed with little ones in mind. The colour palette is warm, soft and inspired by nursery rhymes and what we love most of all about the hues is how truly ageless they are. The colours will look timeless even as your baby grows. 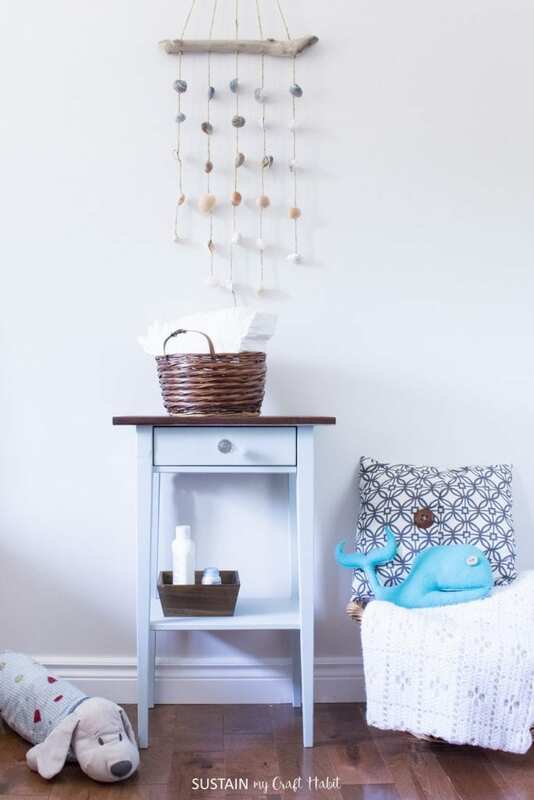 Not only are the colours beautiful, but Fusion Mineral Paints are zero VOC and non-toxic so you can feel comfortable about the paint in your baby’s room. We’ve been very lucky to have had the opportunity to work with Fusion Mineral Paints on recent projects. 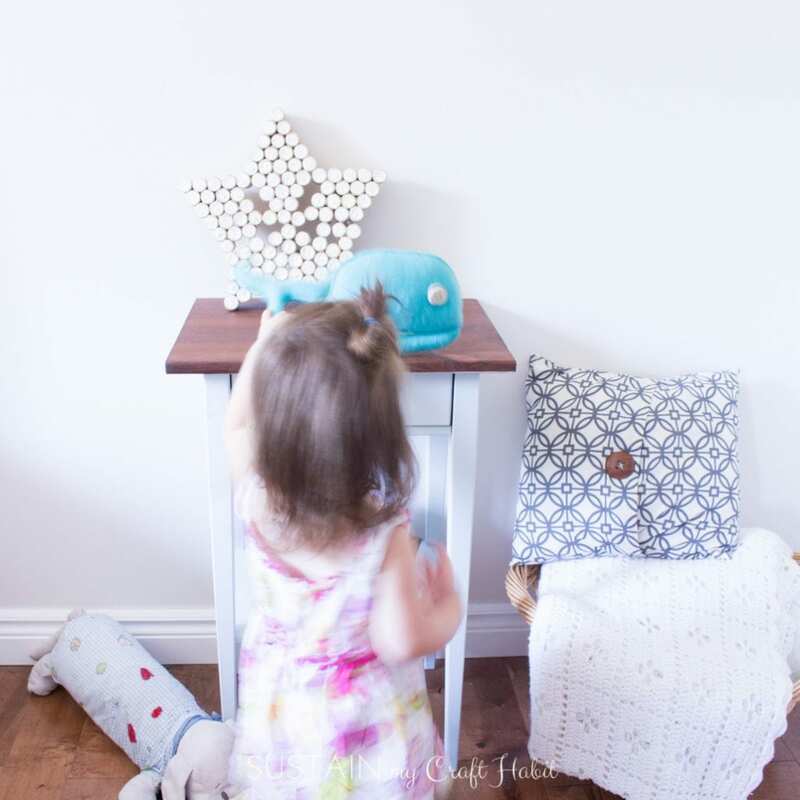 A few months ago we upcycled a beach-inspired farmhouse dresser for our family cottage and then created a lovely rustic wall hanging with pine cones. I’ve had a pair of IKEA Hemnes nightstands for quite a while now, and they’ve been in desperate need of a makeover. I loved the red when I bought them but have long since moved away from red in my home (I don’t think they even sell it anymore!). 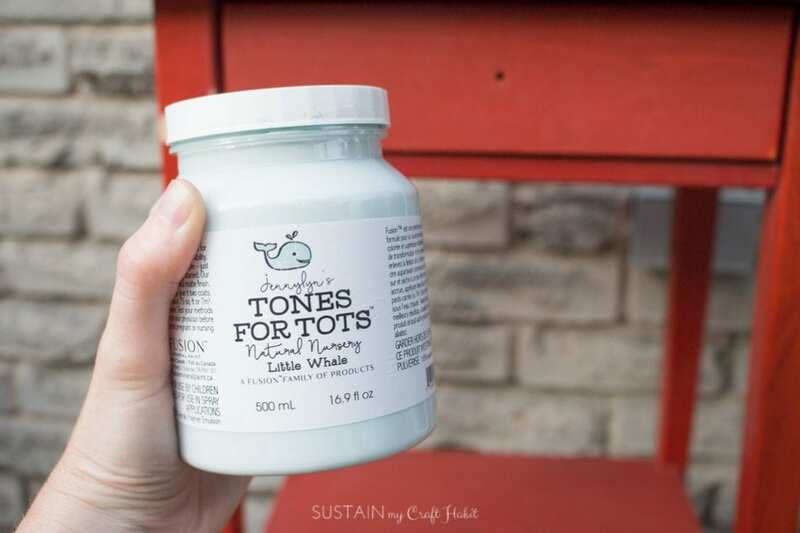 I wanted to try staining a portion of the side table knowing that I was using Tone for Tots which are free of substances that could harm babies. 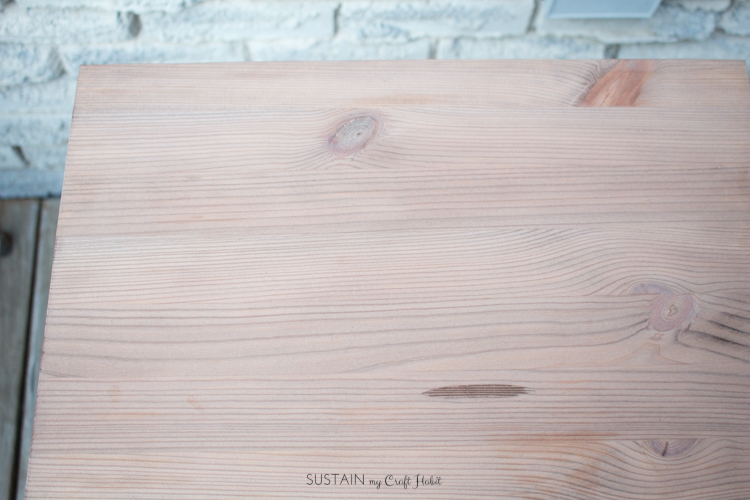 We challenged ourselves to find a natural stain for the top of the tables and decided to make our own totally natural coffee wood stain and beeswax and olive oil furniture polish. 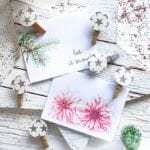 You’ll be amazed how easy they were to make! 1. 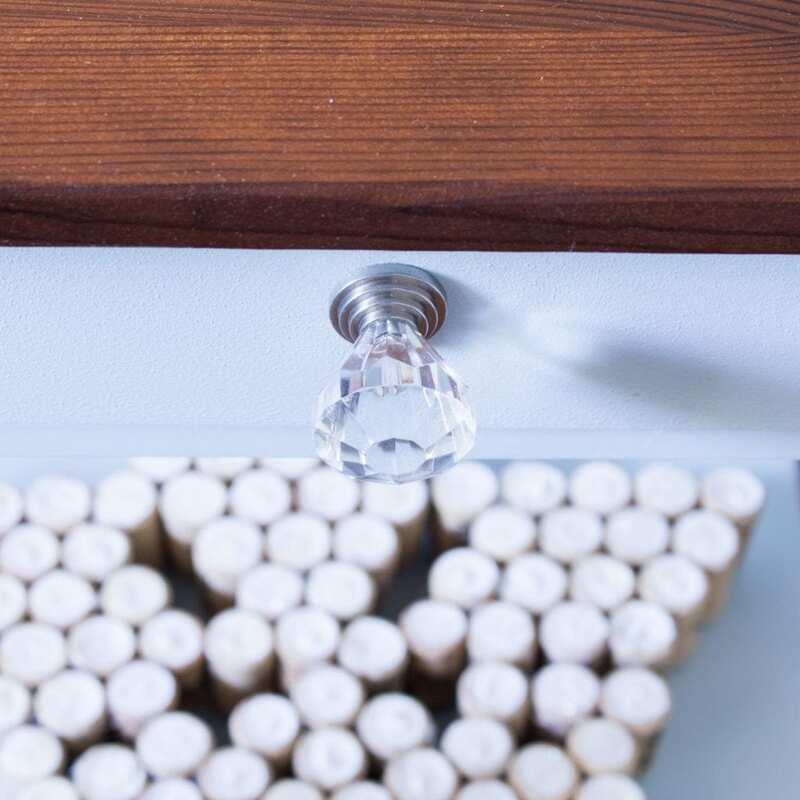 To begin, remove any hardware or drawer knobs from the nightstand and set aside to put back on after painting, or to save for a future project! 2. 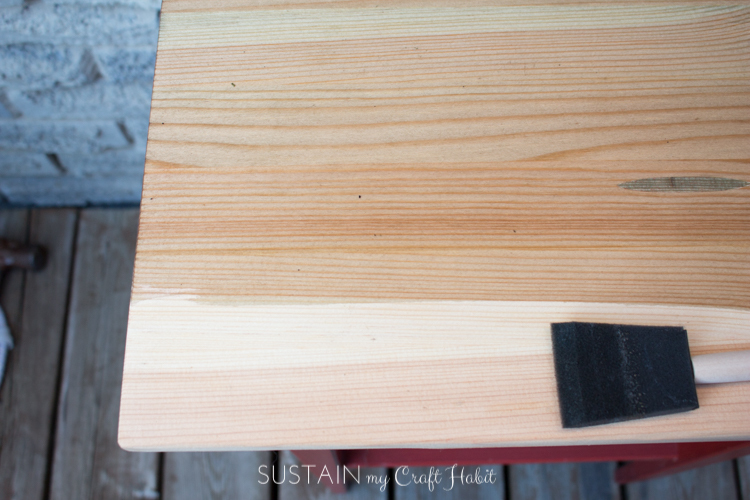 Sand the top of the side table using a hand sander until the natural pine wood is exposed. Wipe off all loose sawdust before moving on to the next step. 3. 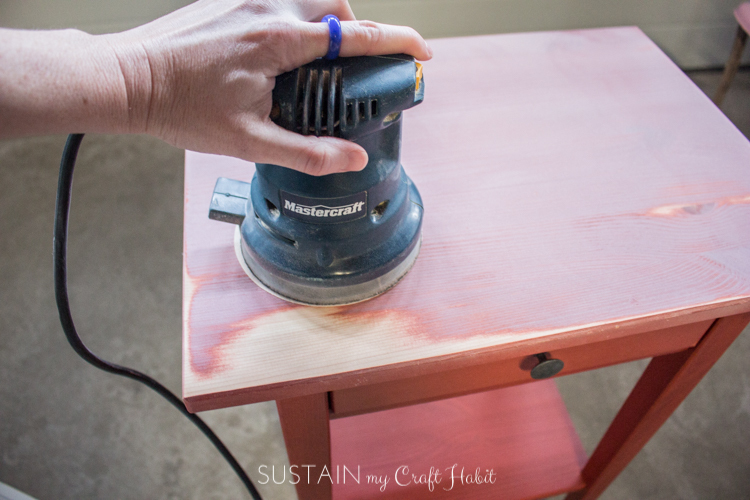 Apply a smooth and even coat of the Fusion Mineral Paint onto the legs and bottom shelf of the side table. There is no need to prime the piece ahead of time. 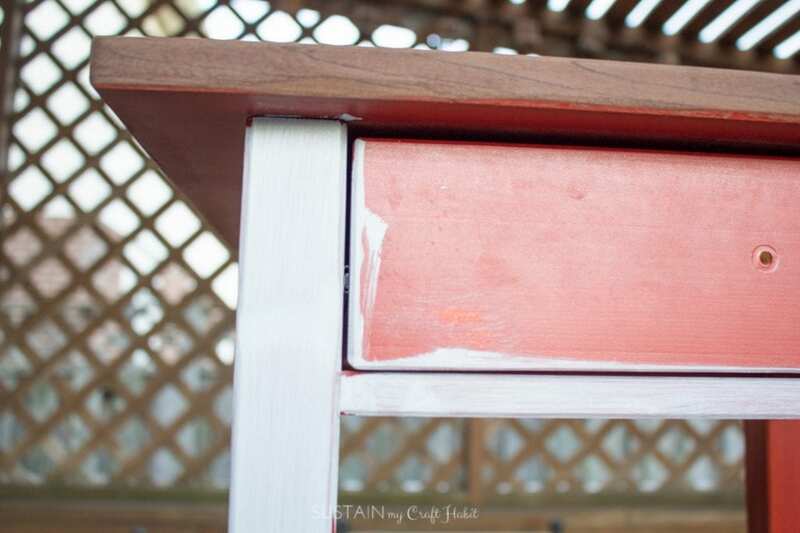 (However, to cover the original bright red paint of the side table, I needed to use two coats of the Fusion Mineral Paint). Let dry. 4. 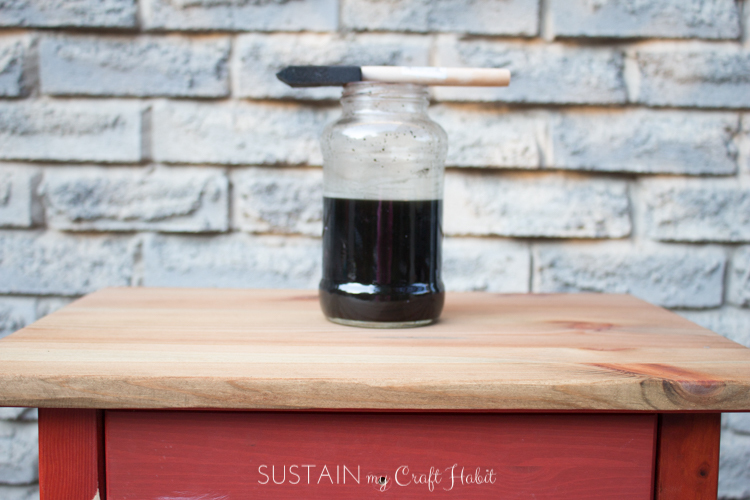 Apply the coffee stain to the unpainted surface of the side table using a foam brush. Don’t worry…it looks green when it’s first applied but dries into a rich, coffee colour. Wipe away any loose coffee grinds using a clean cotton rag. 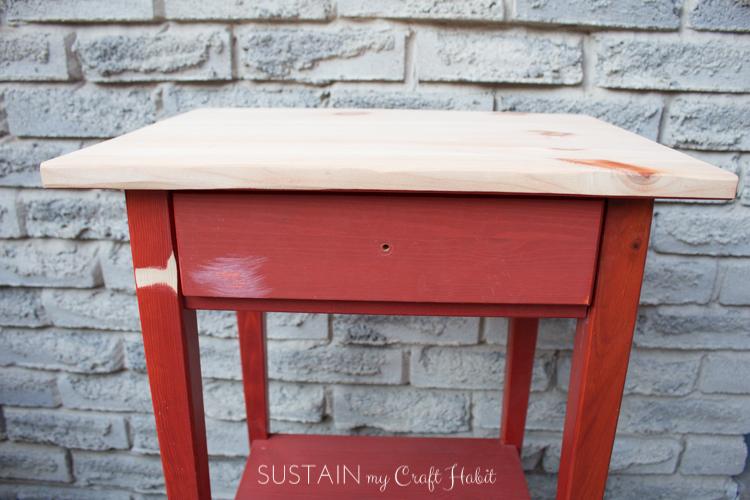 Apply as many coats as you like until you achieve the desired finish but allow enough time to dry in between coats. 5. 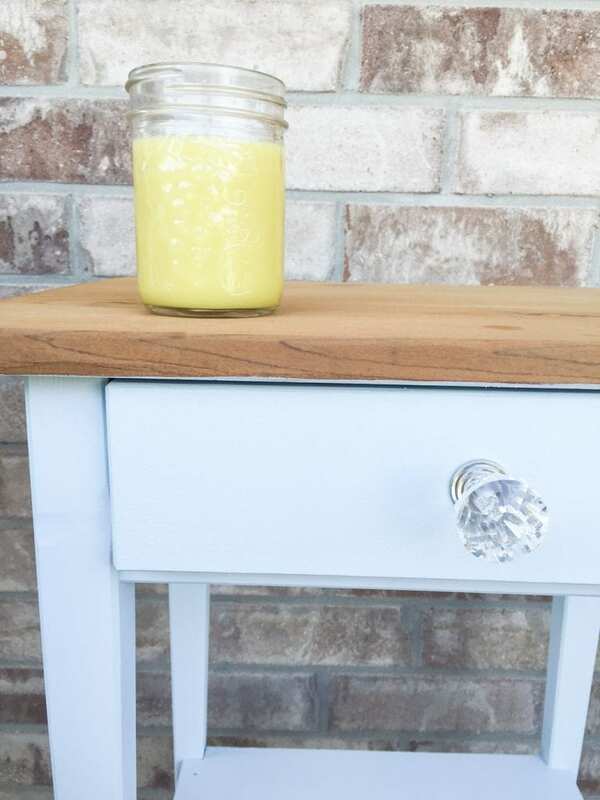 Finally, apply an even coat of the beeswax furniture polish with a clean cottage rag or paper towel. Let dry. 6. Replace the drawer knob with the same or with new hardware. 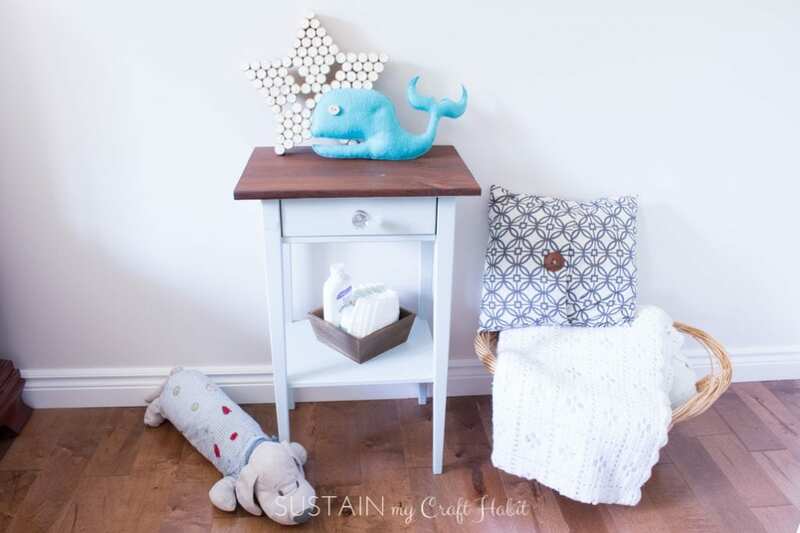 We love that this upcycled IKEA Hemnes nightstand is now made with zero VOC and non-toxic paint and an all natural stain and sealer. 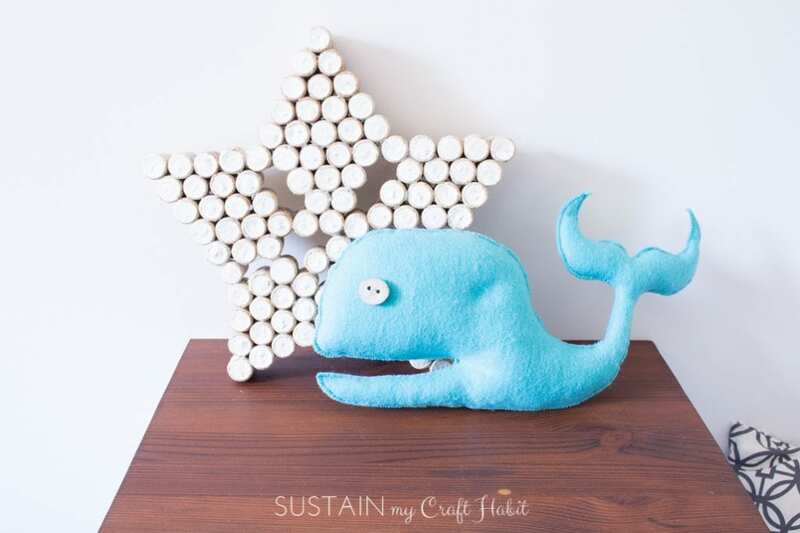 This piece of furniture would be perfect for a baby’s room, especially with a little felt whale made with the help of the Tones for Tots Little Whale stencil set. It’s also pretty great that the piece is sophisticated enough to still be appropriate as baby grows! 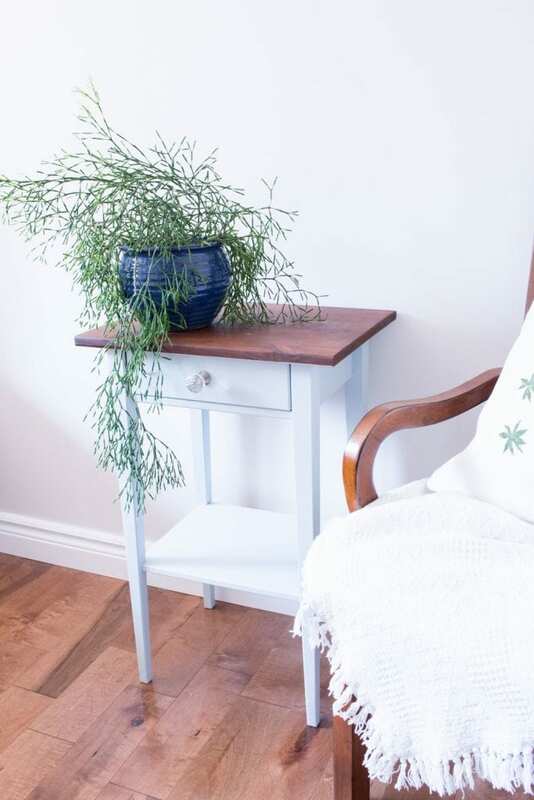 Do you have any furniture pieces at home that you’re just itching to makeover? 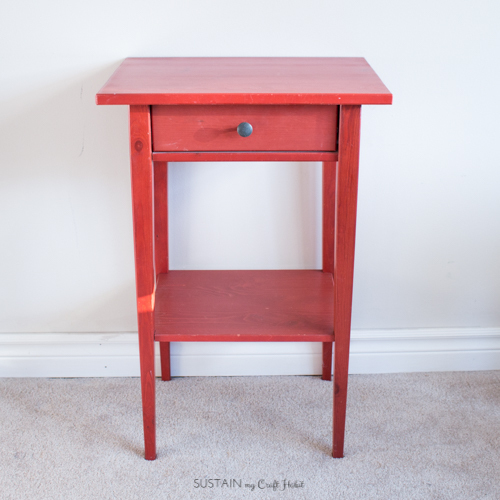 Love your side table transformation Jane and Sonja!! I love the colour and aren’t Fusion Paints just the best! The drawer pull is an awesome addition!